On 17 May 2015, Palden Trinlay, a monk in Sichuan’s Kardze County, was released after seven years in jail. He had been arrested in 2008 for protesting against China’s rule in Tibetan regions. His physical condition remains unknown, but reports from March 2014 described him being in bad health, and revealed that the authorities denied him access to any kind of medical treatment or care. Prison authorities in southwestern China’s Sichuan province have freed a Tibetan monk jailed in 2008 for his role in protests challenging Beijing’s rule in Tibetan areas, returning him to his home in secret to prevent public celebrations, sources said. 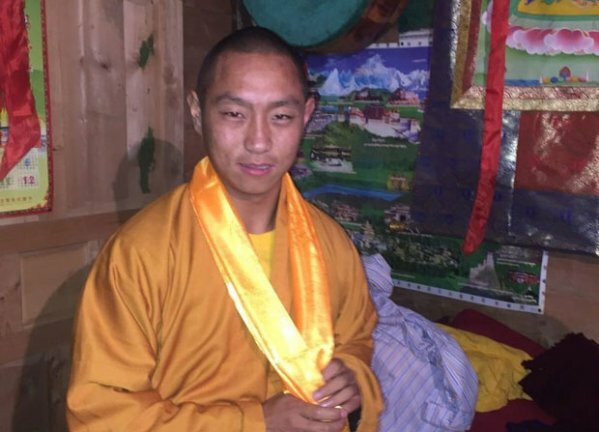 Palden Trinlay, a monk of Kardze monastery in Sichuan’s Kardze (in Chinese, Ganzi) county, was released on May 17 after serving a seven-year term and arrived home at about 3:00 a.m. the next day, a local source told RFA’s Tibetan Service. “To avoid a reception or other welcoming activities, he was privately escorted by two police officers, but the local Tibetans were expecting him and waited all night for him to arrive,” the source said, speaking on condition of anonymity. “He was welcomed at home when he finally reached his house,” the source said. Trinlay, now 26, was 19 when he took part in a May 18, 2008 protest in Kardze town along with five others, a second source said. “He was detained and then sentenced to seven years in prison by the Kardze People’s Intermediate Court,” Gonpo Trinlay, a former political prisoner now living in exile, said. “He was released on May 17 after completing his sentence, and three police officers went from Kardze County to Deyang prison to receive him,” Gonpo Trinlay said. Earlier reports had identified Palden Trinlay’s place of confinement as Mianyang prison, also in Sichuan. No details were immediately available on Trinlay’s physical condition at the time of his release, though reports in March 2014 had described him as being in failing health, with authorities refusing him adequate medical treatment or admission to a hospital. The four protesters jailed with Trinlay—Jampa Dorje, Gongkar (or Kunga) Trinlay, Jamyang Tsering, and Tsewang Khedrup—were released earlier after serving shorter sentences, Gonpo Trinlay said. Sporadic demonstrations challenging Chinese rule have continued in Tibetan-populated areas of China since widespread protests swept the region in 2008, with 139 Tibetans to date setting themselves ablaze to oppose Beijing’s rule and call for the return of exiled spiritual leader the Dalai Lama.